Portland has arrived at an interesting nexus, forming the basis of an important, structural element that will reform police engaged in illegal use of force. Allies are networking to produce evidence. Videographer Joe Anybody is one of a growing community who take time to film police in the public performance of their public duties. What we find inspiring is that Mike BlueHair edited Joe’s footage to overlay relevant pain compliance policy. 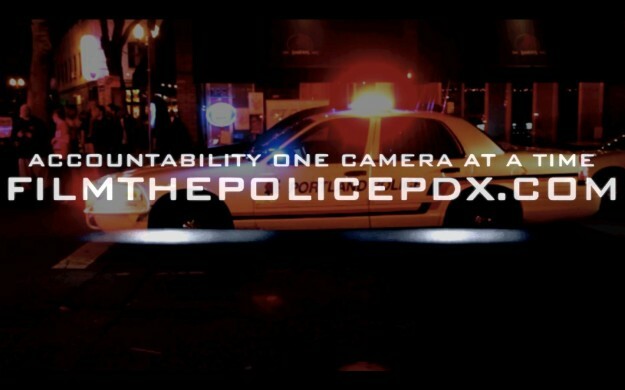 Through social networking by sites like Film the Police – Portland and Oregon’s Chapter of CopBlock, the community has a means of distributing video evidence. One of the elements Consult Hardesty thinks should be added to our draft Civilian Compliance & Reform Authority is a ‘video drop box.’ We’d like reformers to maintain a repository where folks could deposit digital files documenting police conduct. We’d like lawyers to pay for it, in the hopes that images would help them make cases on behalf of victims. We’d expect the City’s Independent Review Board to troll the site, pro-actively looking for cases to review. We’d also expect the City’s police Training Advisory Council to draw from the drop box … to direct police training to address deficiencies. Of course, the problem is that TAC is a closed body. ‘Public’ participation is limited to those hand-picked by perpetrators of police violence. Don’t forgo the second element (at 3:00, here). It’s not only police engaging in illegal use of force against vulnerable groups. Their health care allies are harming us as well. Prompted by the Department of Justice, Civil Rights Division, as part of a plea deal to avoid prosecution for patterns of 14th Amendment violations, the City has begun sending an additional $5,000,000 annually to Portland Police. Having been caught illegally using force against “those perceived to be in mental health crisis,” law enforcement will now make assessment and delivery of care a part of their mission. We figure this should be a role for EMTs … or firemen; not a bureaucratic retrofit in an era of declining crime. DoJ Findings (pg. 13) show health care workers to have been co-perpetrators in illegal use of force. In the DoJ’s documented instance, ‘care givers’ stood idle as beatings and electronic control weapons injured victims. In the video above, two years later, we fear mission creep and an absence of disciplinary measures has made ‘care givers’ actual instigators of violent response to the most vulnerable among us. We know police are being militarized, from Balko’s The Rise of the Warrior Cop and this week’s New York Times. We merely caution you that those with a health care orientation are adopting police use-of-force tactics. The second element in the video above shows this. We’re being told police are becoming more sophisticated, that victims in crisis will be better attended to. The DoJ Agreement provided no care facilities be funded, instilled no discipline mechanisms for violent offenders. Some of the millions of dollars are being spent to create lists of folks to be targeted by this new police role. We plunge into the absurd when we allow intrusion on civil liberties, based on thoughts someone might someday harbor. We’d like to see improvements to training be the logical outcome of the above video evidence. We know the Auditor’s Independent Review Board is not pro-active. It does not seek out improper conduct, it’s role is to merely thwart citizen-initiated complaint. The People have no means to press training concerns upon the police bureau. Local government is unwilling to make training responsive to community need. Never has a City Council order of discipline against officers been upheld by state arbitrators. Every officer has been returned to duty, with full back pay restored. This is a disincentive, to put it mildly: get caught killing an unarmed man in the act of submission – as Officer Ronald Frashour has – and you’ll get to spend your days collecting a paycheck … while not reporting for duty. The City left this ‘stay out of jail, free’ feature intact in it’s recent, 5-year contract with the Portland Police Association. The linchpin to this injustice is the bureau’s Training Unit. Despite contrary rulings by Command Staff, they simply appear before the arbitrator (and investigators and prosecutors) to say even the most egregious conduct was ‘within policy.’ Authorities promptly exonerate the killer. We encourage your input. Help us develop a strategy to restore civilian authority. Police the police. We figure it’s your job. The drop box is absolutely a great idea. Involving the City does not strike me as a great an idea. First off, the City Attorney is quick to squash anything that might threaten PPB’s unfettered power and minimal accountability. Just look at the Council minutes when they voted to appeal the Gallagher Smith vs. PPB court award. And as Steve Novick pointed out (as if from the mouth of a babe), Council’s attitude is that unless wealthy Portlanders want something, they’ll just mount an expensive campaign to fight it, so why bother trying to do the right thing? Or they’ll make it prohibitively expensive as they have the simple act of pouring sidewalks. If you stop and talk to people targeted by the police, they all have stories, they all have video footage or know someone who does, they all feel threatened (or have actually been threatened), and they are more likely to engage with a peer community group than their elected officials. I say your ideas are excellent and well-founded but, unless we throw the rascals out, we’re better off with truly and completely independent police review. Let’s get that drop box and promote it to community groups in our own neighborhoods. Even Amanda Fritz can’t find anything on the City’s website! Thank you for your thoughts, Tessa. We’ve circulated this model and believe broad community support will get two, successive tiers of philanthropic funding, but we still need input on how to build a financially sustainable Constitutional Rights & Oversight Center. In September 2014 I saw (and recorded) the same two CHIERS workers in a similar case … with no pain hold being used. More at my Indymedia post, (here). You do important work, Joe. Your September documentation shows how far police culture must travel, to arrive as a bureau capable of delivering care to those in need. When compared to firemen or EMTs, cops face a steep learning curve … as indicated when Officer Allen encourages the man in need to lean back, and face the possibility of aspirating vomit into his own lungs (at 7:10). Should The City incorporate your work in reviews by their Training Advisory Council, we might expect improvements to job performance. Unfortunately, local authority keeps circling the wagons, avoiding input from those who know so many are victims of police misconduct.